Everyone loves a photobooth, young or old. 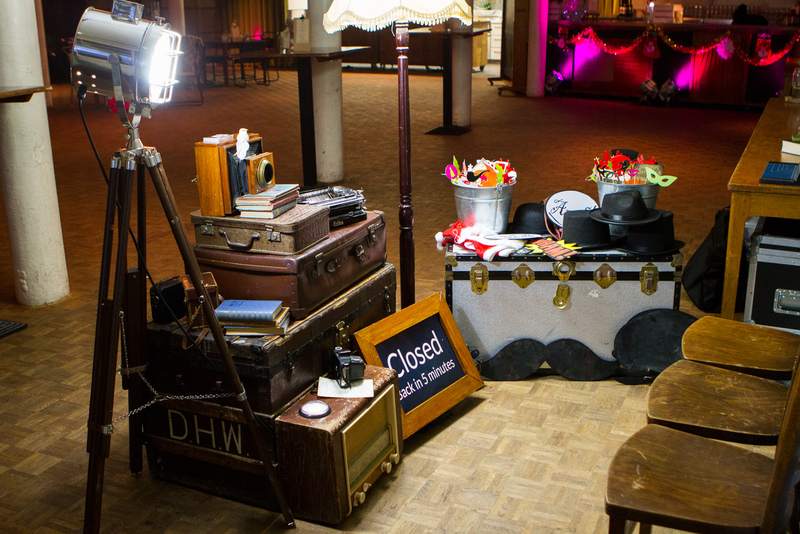 Photo booths have a really broad appeal and we really do love supplying them to weddings all over the country – but occasionally some people ask us if we’re able to do something a little different – et voila, vintage booth was born. Founded in 2005, Angelic Photo set out to provide brides and grooms across Northamptonshire and the Midlands with great quality wedding photography. 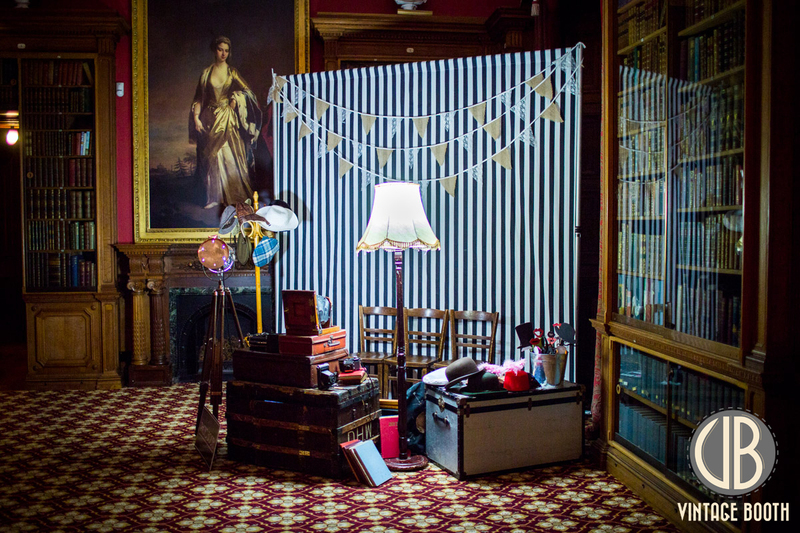 Many people asked us if we’d be able to supply something more relaxed in the evening, so we built our first flexible photobooth with a backdrop to suit the venue rather than being rigid and fixed. Always on the lookout for something new and quirky we got the idea in our heads about a vintage-themed booth – and we’re never ones to do things by halves! Have a look around, check out our booths and email us if you think it’s something you’d like at your wedding – remember, ours is totally unlike any other booth in the country and our prices start at just £495 for three hours (combined package discount available if you have us (Angelic Photo) to do your wedding photos). 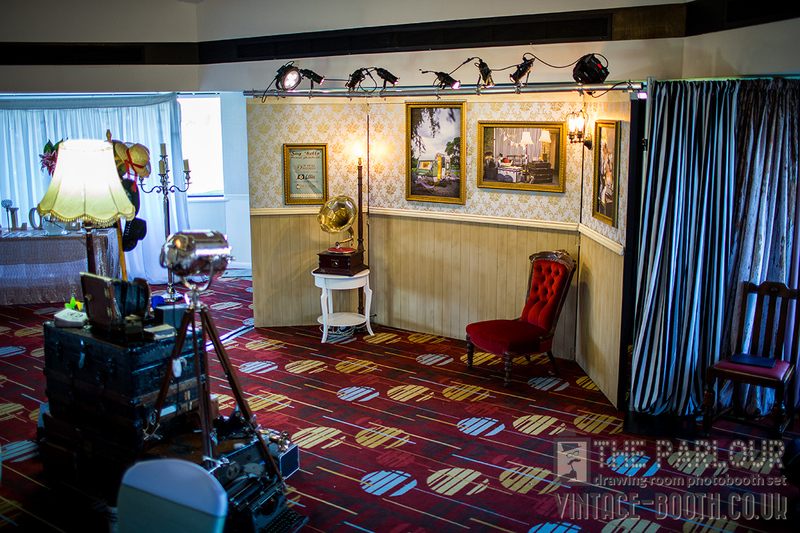 The first of our vintage photo booths was created at the tail end of 2013 with a view to providing the wedding and events market with something totally different and aesthetically fabulous. There’s an absolute plethora of the more traditional ‘coke can’ booths and magic mirror photobooths out there at the moment – you know the ones, where you go into a shiny plastic pod with a neon inflatable guitar. 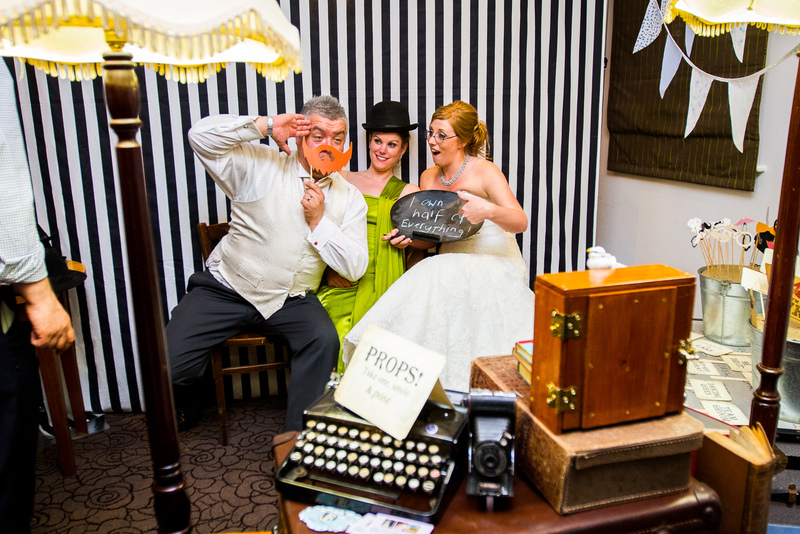 That’s all well and good, but it’s not really our style – sometimes a quirky photo booth with a little more refinement is what’s called for, and so Vintage Booth was born – a different class of photo booth. Have a look through our photos below, the booths are all self-contained which means there’s no break in theme for lighting or a photographer standing there with a camera, all of the lighting is provided for our wedding photo booth by vintage shabby chic standard lamps, and the camera/technology system is all discretely hidden away in gorgeous distressed steamer trunks. Brides, grooms, guests and other people we bump into at corporate events can’t get over just how fantastic our vintage photo booth is – it has all the fun of a ‘regular’ booth but with the added attraction that it just looks so much better! It really fits in well at weddings and events. The booth system is really simple – choose some props, press the button and within about 15s you get a 7″x5″ print of your photos to take away. 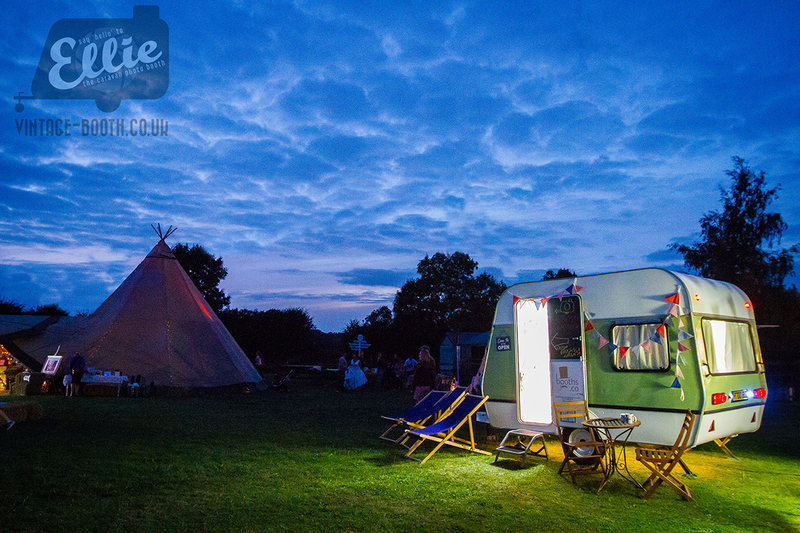 Check out our retro caravan photobooth in the photos below as well. 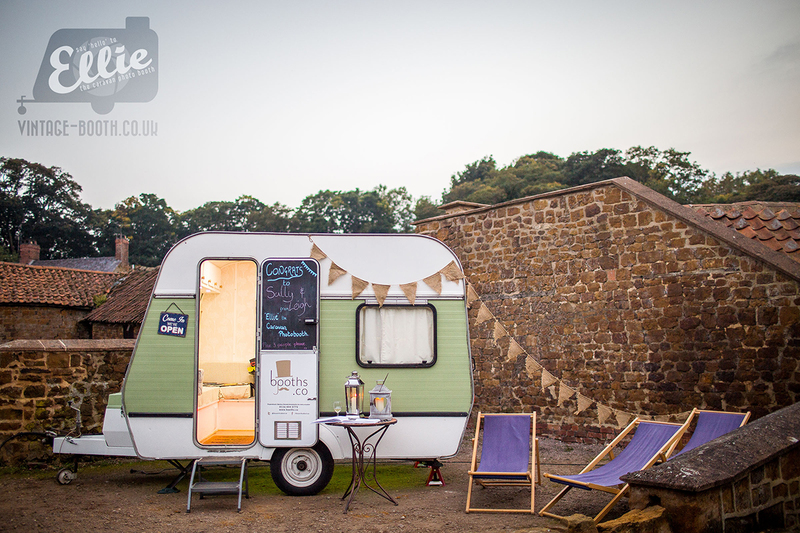 A fantastic addition to our quirky photo booth stock, this lovely little caravan has been restored and transformed into a fabulous photo booth in its own right perfect for weddings and events. 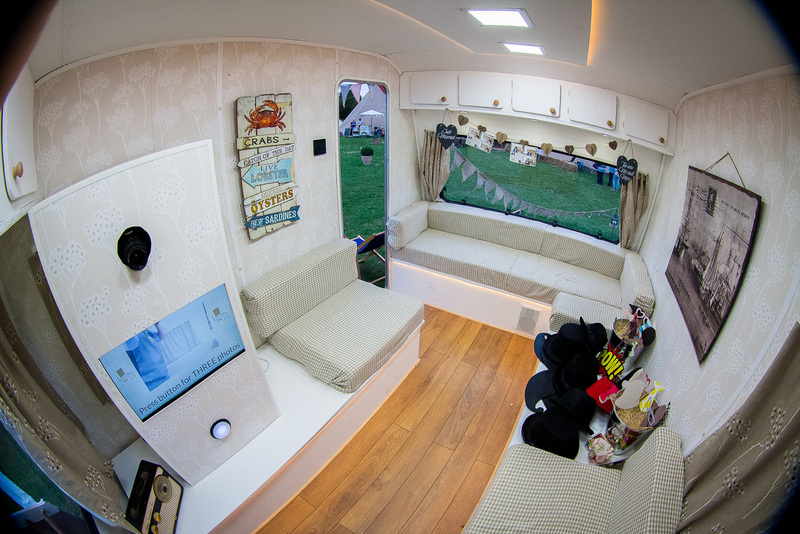 Ellie the caravan looks amazing next to marquees and tipis, and anywhere that you might not have room inside for a photo booth. 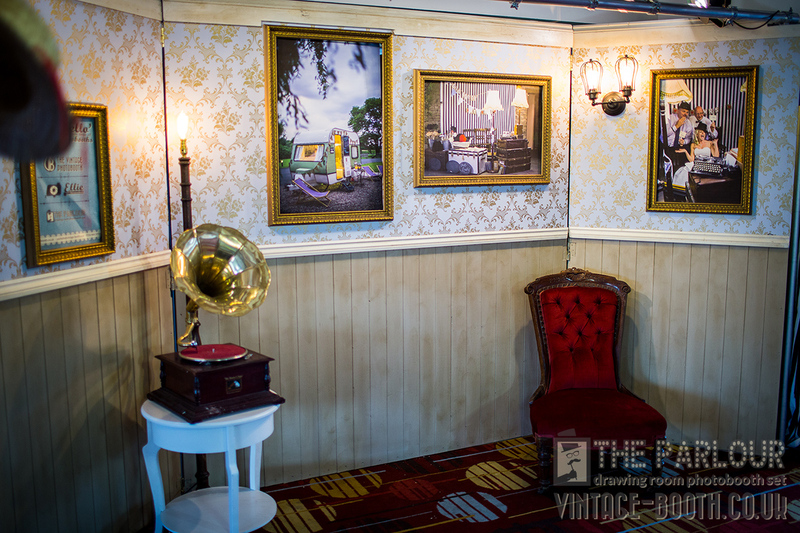 The booth part is exactly the same as our other photo booths in that it’s entirely self-contained and all your guests have to do is pick some funny props, sit down and push the button. A print is printed within about 15s and your guests have something unique and totally different to take away with them! 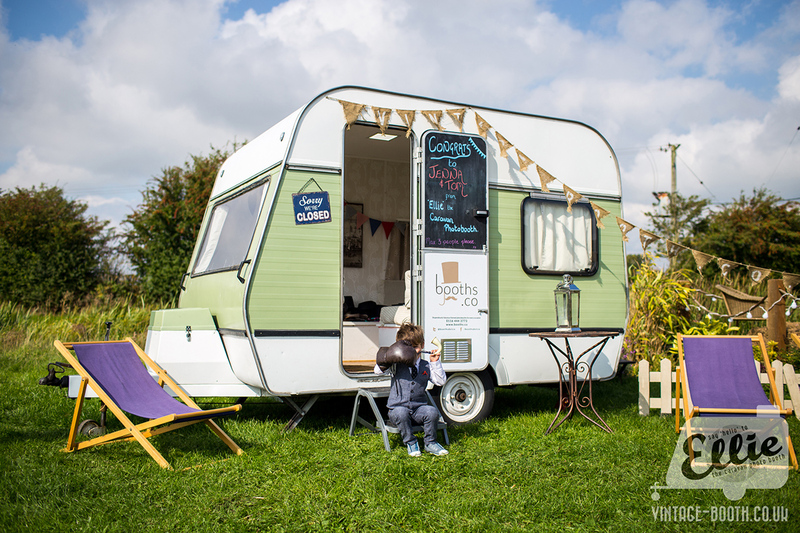 The caravan photobooth is proving VERY popular and we’re really pleased to welcome it into Vintage Booth’s stock of unique and quirky wedding photo booths. 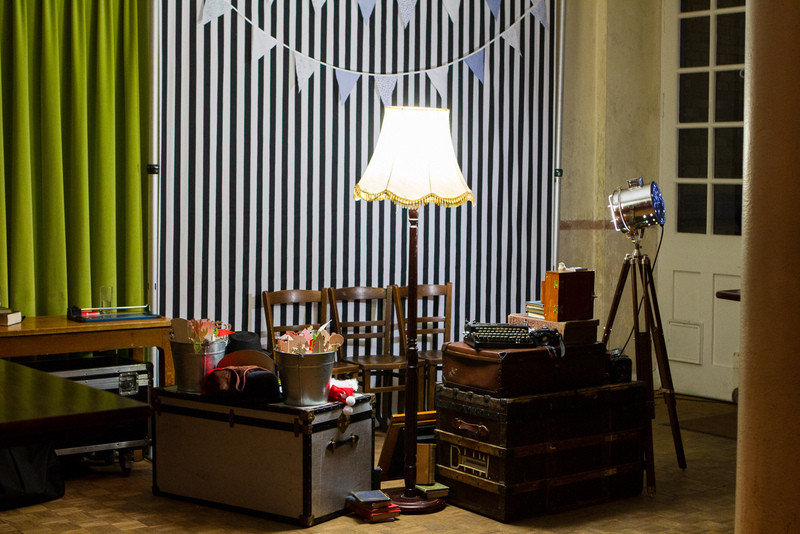 For the larger venue and the more adventurous couple we have The Parlour – our drawing room wall backdrop set. 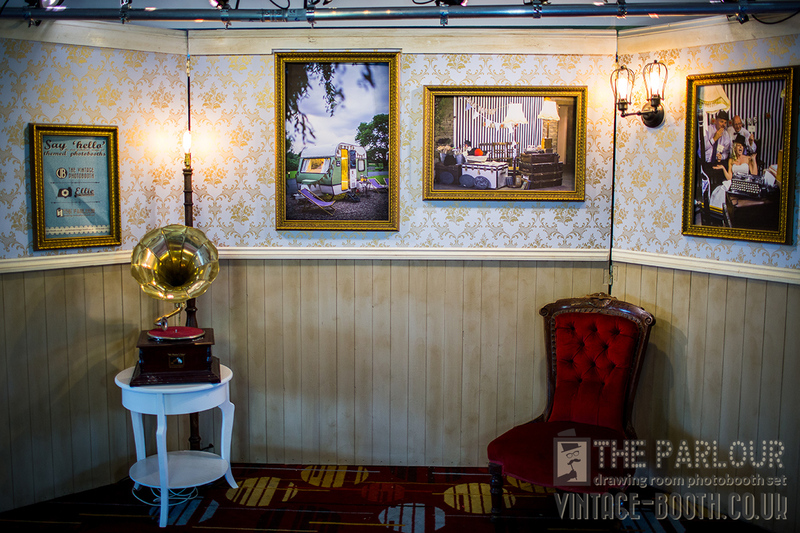 The Parlour is an upgrade for the vintage booth and entails a freestanding 12′ wide wall set complete with wooden panelling, wallpaper, a telephone table with gramophone and a small red vintage chair. Suitable for the larger venue The Parlour has four cut panels surrounded by gilt picture frames, the twist being that each frame is a hinged door – so your guests can stand behind and truly be ‘in the picture’. For the actual pictures we can even get a selection of your photos printed to use as placeholders for a small extra cost. At the moment The Parlour is an addition to the Vintage Booth at £200 extra (so £695 for 3hrs, £795 for 4hrs etc.) 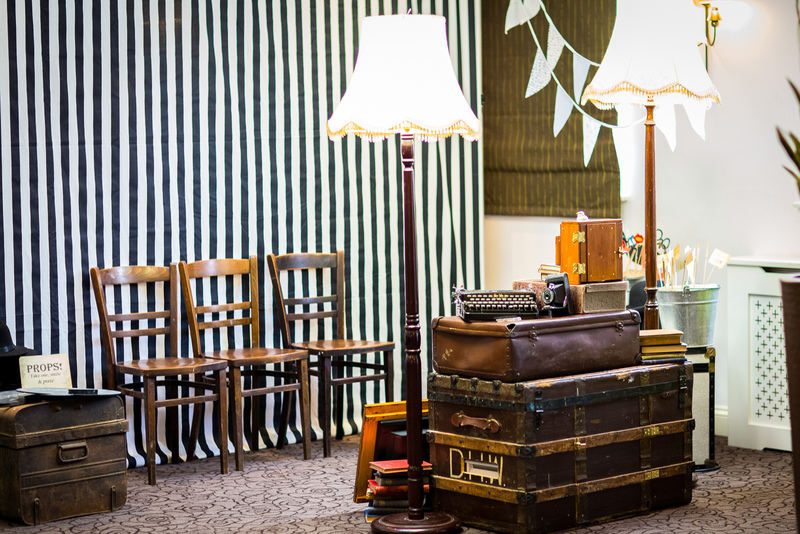 and includes everything you get with the vintage other than the black/white cloth backdrop and the chairs, the four photo frames can be fully branded for an additional £50. 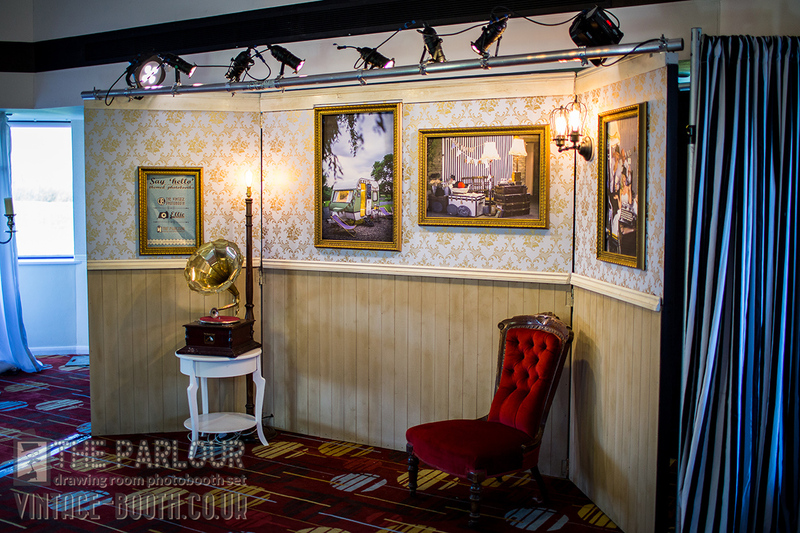 We’re restricting the number of photos taken with each booth use to 1 for The Parlour as it doesn’t really lend itself well to changing props and running around for obvious reasons! 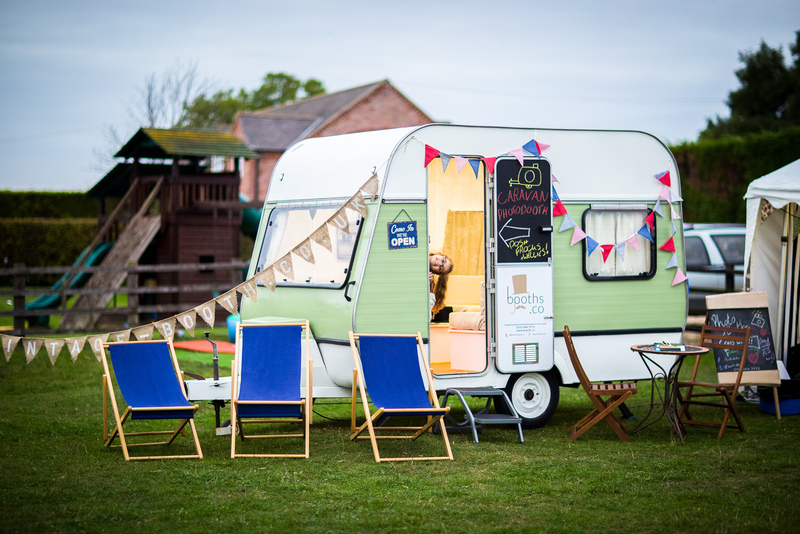 Betty the Bell Tent Photobooth is the latest addition to our stock of wonderfully unique and quirky photo booths with a difference. 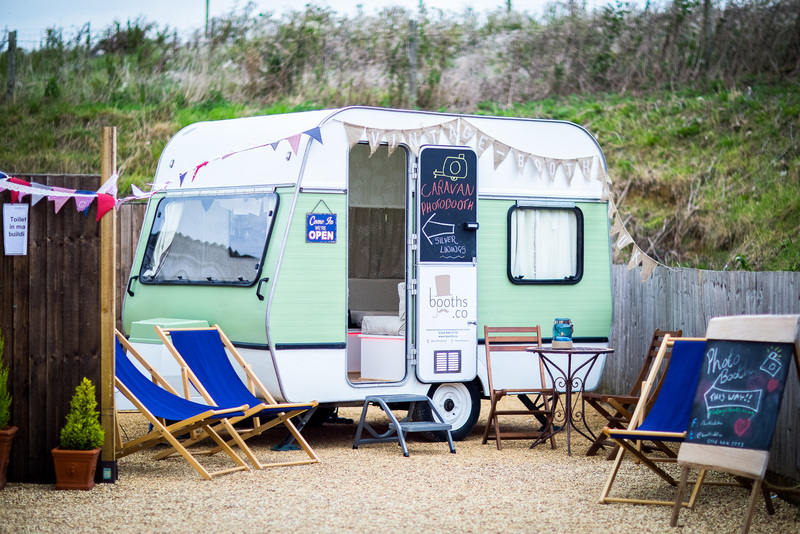 Betty looks amazing set up next to tipis for tipi weddings with the added bonus that no extra room is take up inside – as we literally bring the room for the booth with us! Betty is a 6m diameter bell tent (so roughly 9m diameter with guys) enclosing a fabulous shabby chic/vintage/retro/Moroccan style booth with apple crates, Moroccan throws & lamps, bamboo styling and some lovely colourful rag rugs. 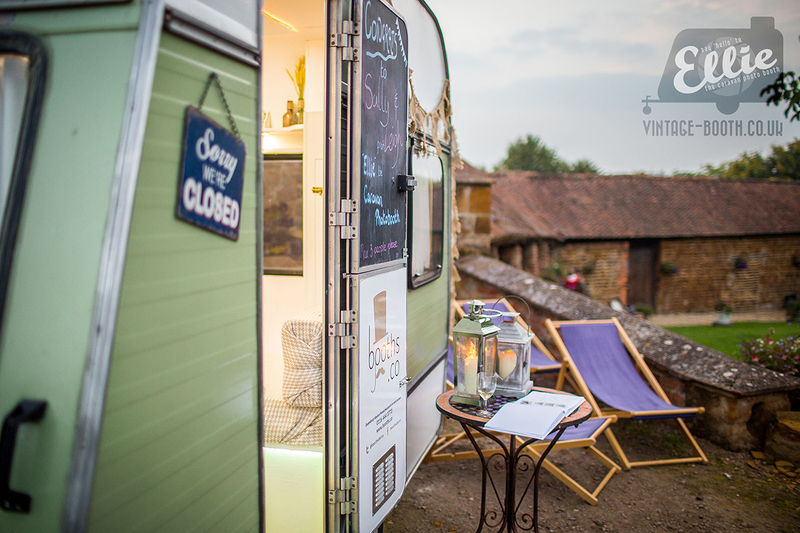 The Bell Tent costs the same as our Parlour Wall photo booth – so starting at £695 for a three hour package fully inclusive of everything you’d need. 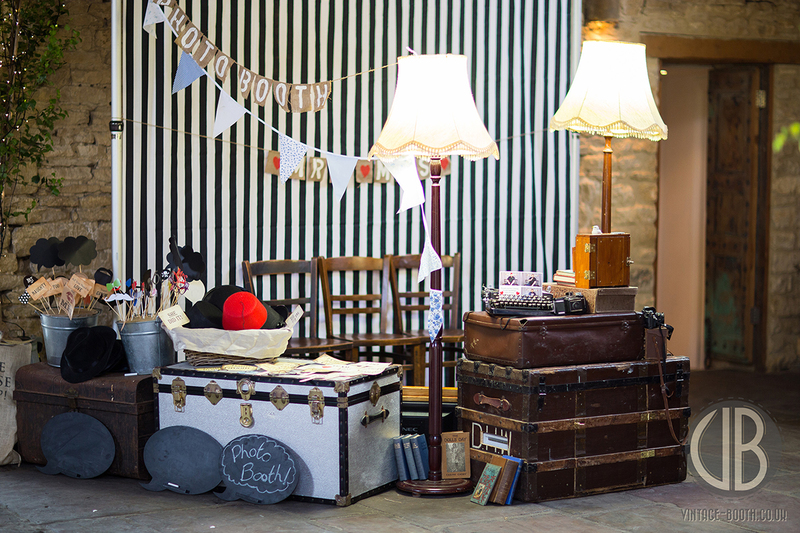 For the ultimate in laid-back wedding photobooth shenanigans! In the same way as any of our booths, you can have Betty on site and set up for the whole day if required with our full day upgrade, that means she’ll be set up and open – but only working as a booth for the time you’d like (so you could have the setup on site from the morning of your wedding but then operating as a booth 7pm-11pm for example). 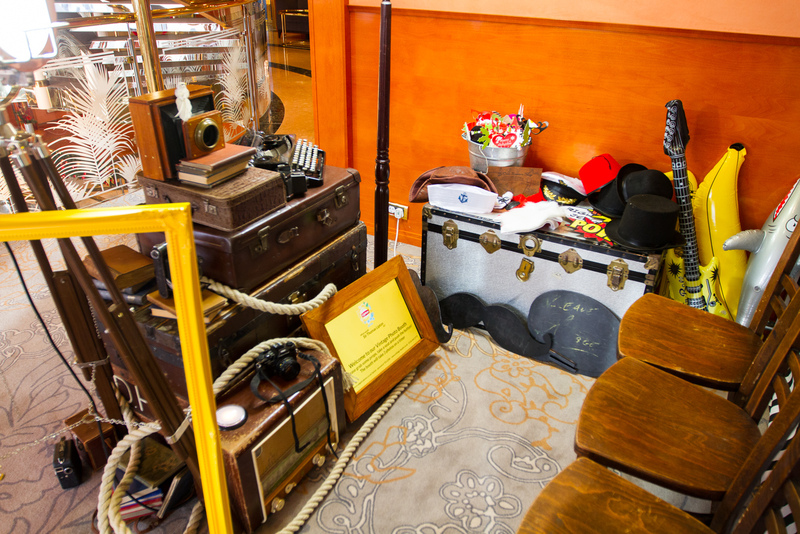 You’re fully furnished with a box of lovely props for your booth, moustaches on sticks, bowler hats, speech bubble chalkboards and more! These all add to the unique fun of our booth and really get people into the spirit. Your prints can be fully customised in terms of layout and branding. If you want to incorporate your wedding design or corporate logo that’s all good. Prints on the night are unlimited and available for further purchase on our gallery (at very reasonable rates!). 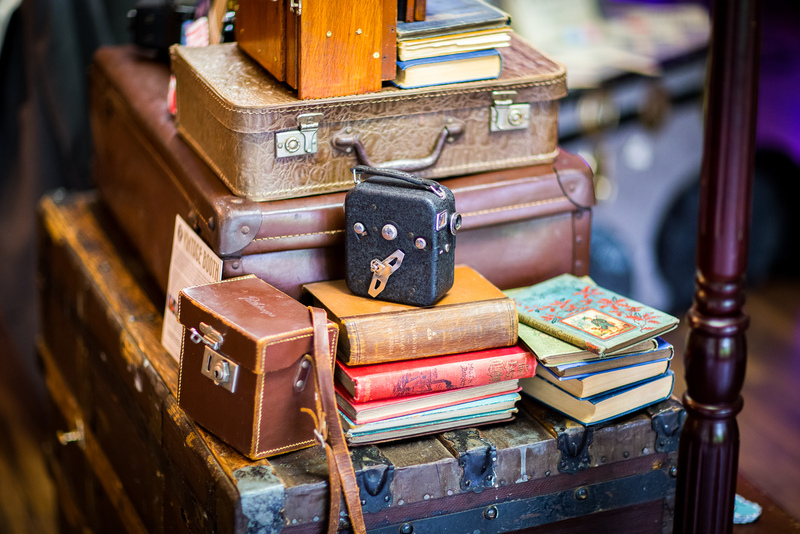 One of our assistants will be on hand for the entire duration, usually setting up around an hour before it’s needed. All of our assistants are very friendly (that’s why we use them!) and knowledgeable in case anything goes wrong. We have our own smart workwear or we can wear clothes to your spec. All of your photos go onto our web gallery at no extra cost – this is password protected and you get a full year’s access so that your friends and family can view your photos. Both the original images (i.e. the photos taken) and the composites (i.e. the prints) can go on. Our prices are all easy to understand, with no ‘hidden extras’ or catches. Our minimum package is three hours at £495 with each additional hour being £100 so a four hour package is £595, five hours is £695 and so on. Most places within a 65 mile radius of our base in Leicestershire are a minimum of three hours at £495, sometimes more sometimes less depending on the location and date of your event – get in touch for an accurate quote. We’re based in Leicester but work nationwide – there’s no extra mileage charge but we may ask that a minimum package length applies to cover our cost. Included with ALL packages is an attendant on site throughout, unlimited use & 7″x5″ prints on the night, a bunch of props on sticks and a password-protected gallery. We can also offer guestbooks at £35 each for an A4 personalised book or one of our spiffing custom branded USBs in a cute little box for £35. We always include unlimited 7″x5″ prints on the night, our booth can take anywhere between 1 and 99 photos per print, most people go for two strips of three or four in a row, but it’s all very flexible and completely brandable. Your photos all go onto a password-protected gallery too so that friends and family can log on and see the fun! Here you can see a selection of our recent photobooth images and some pictures of how our booths look, have a look at our booths below or have a look at our client photobooth galleries to find pictures from your event. Or just fill in the form below (it’s much easier!) – we try to reply to every email within 24 hours, if you don’t get one back then please check your junk folder or give us a ring. It really helps when you give us as much information as possible so if you’d like to detail when and where your event is along with which booth takes your fancy it’ll make our lives much easier! Cheers.